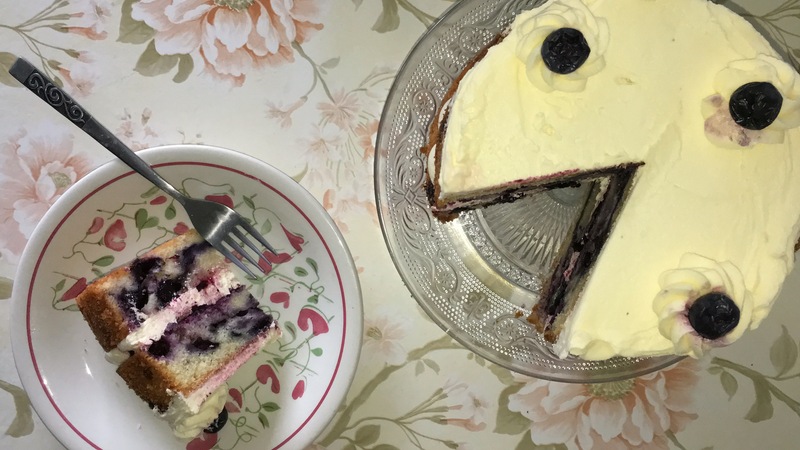 If you’re looking for the easiest and best recipe for a lemon and blueberry cake, look no further as I have you covered. As mentioned above, this cake is the easiest and best recipe for a lemon and blueberry cake. After a few tests on making this cake, I finally found one that works well. This recipe includes how to make the cake, the lemon simple syrup, blueberry jam and lemon buttercream. Although there are a few different stages to this cake, they can be done at the same time, so don’t worry if you want to make this. Don’t be put off, it’s pretty simple. 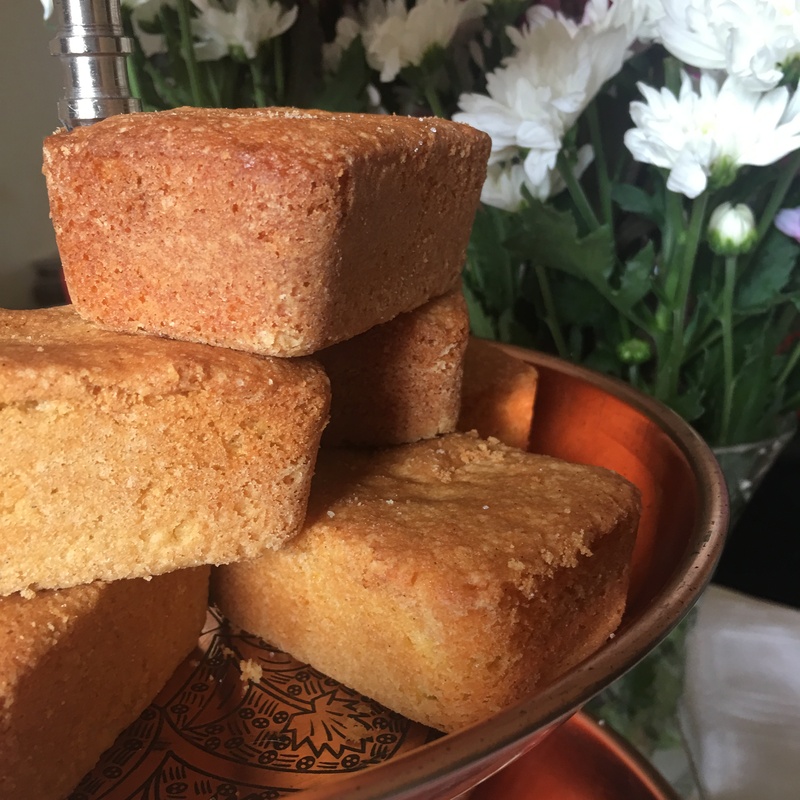 When it comes to starting this recipe, you can start with whichever stage you like, personally I do the longest process first and in this case, it’s the cake. Before I start, I do a bit of prep. I start by preheating my oven to 180˚c/350˚f, weighing up all my ingredients (this saves you a lot of time when your mixing the cake, plus it saves you from making mistakes and faffing about) and if needed, preparing your 6-inch cake tins by either buttering and flouring or lining them with greaseproof paper (whichever method works best for you. I didn’t do either method as the tins I was using are non-stick). To make the cake, start by placing the butter and sugar into a mixing bowl of choice and beat together until well combined and lighter in colour and consistency. Once you’ve reached that stage, you’ll want to then add in the eggs, one at a time, beating well in-between each addition. Don’t worry if when you’re adding your eggs to the mixture it curdles, just add a small amount of your weighed out dry mix to fix the curdling. Once the eggs are all incorporated, sift in your dry ingredients and then mix over a low to medium speed just until the dry ingredients are incorporated. In a small bowl, place your blueberries (fresh or frozen, either works well here. 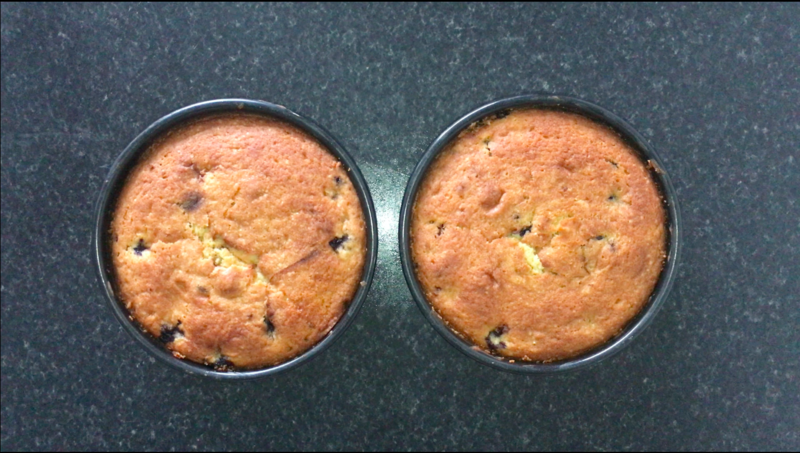 I used frozen but feel free to fresh if you can get them) and add a small amount of plain flour and give it a brief mix, just to coat the blueberries, then add the blueberries into the cake batter and fold them in using a spatula just until they are well distributed. Once the cake batter is done, divide between your 2 prepared cake tins (for a more accurate measurement, use digital scales to get a more precise measurement or eyeball it, use whichever method works best for you). Once the cake batter is in each tin, you can then level them off as best you possibly can using a small offset or cranked palette knife or a spoon. Place into your preheated oven and bake for around 25-30 minutes. While your cakes are baking in the oven, it’s the perfect opportunity to make the remaining parts for the cake. I start with the lemon simple syrup, which surprisingly is simple. To start the lemon simple syrup, get yourself a small-medium saucepan and place the water and sugar then give a brief mix, then add in the lemon slices (I went with 4, which was perfect but feel free to adapt it to suit you). Place that saucepan on the hob over a low-medium heat until it reaches a boil, this is normally achieved in 7-9 minutes. Once it’s reached a boil, get yourself a bowl/jug and a sieve/strainer and pass the mixture through the sieve/strainer and allow the simple syrup to cool completely before using it. If you’re making this in advance, store it in the fridge. Now that the simple syrup has been made, you can make the blueberry jam filling, which is as easy as the simple syrup. What’s not to love? To make the blueberry jam, get yourself a small-medium saucepan and place in your blueberries, along with the sugar and give them a quick mix. Net add in the water and give a mix to quickly combine the ingredients and then place the saucepan on the hob over a low-medium heat until it comes to a simmer, mixing every now and again. You will notice as the mixture heats up, that it thickens in consistency, just remember while its hot, it’s more liquid (as it cools it thickens and the consistency will look less liquid like and more like jam). 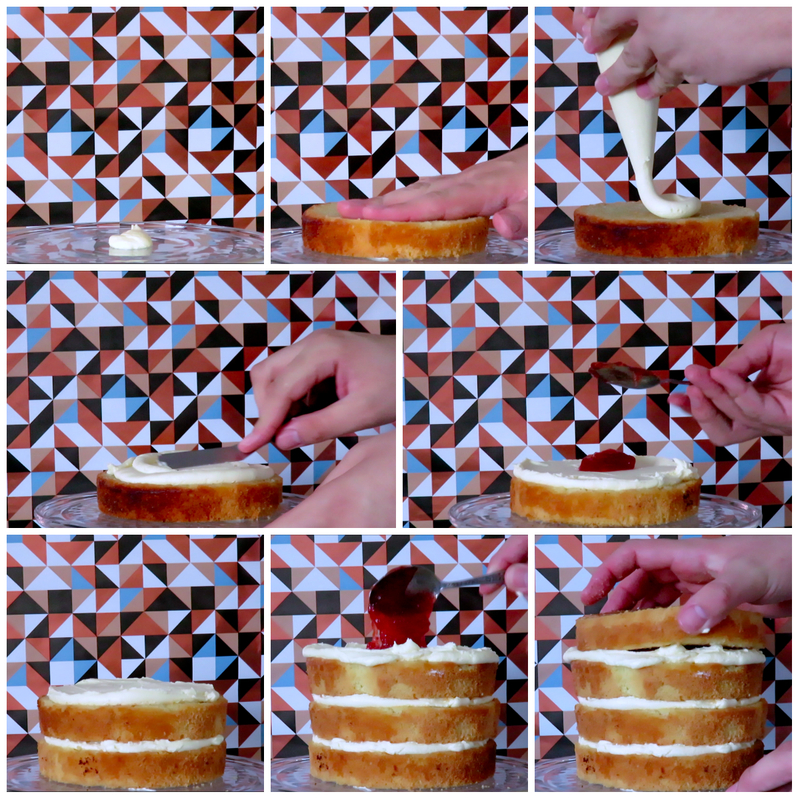 All the jam to cool completely before using it, otherwise it will melt the buttercream and ruin your cake. Now your cakes are fully baked, you’ll want to remove them from the oven and allow them to cool in the tins until you can handle the tins, for me this was about 15-20 minutes (my kitchen is cooler, so this helps), then remove the cakes from the tins and transfer them to a cooling rack where you’ll leave them until they completely cool. While your cakes are cooling, why not make your buttercream? The buttercream isn’t exactly hard to make nor does it take a lot of time. To start, place your butter into your bowl and beat it on its own for around 5-7 minutes, after that time you should notice a change in colour and consistency, it’ll be both lighter and fluffier. Give the bowl a good scraping down and add in all the icing sugar, seeing as I was only doing a small batch I added all the icing sugar in a single addition but for bigger batches I recommend doing it in 2 batches. Mix the icing sugar in on a low speed to start and work your way up to medium and then high over a couple of minutes, add in some lemon juice to flavour and loosen the mixture a little, feel free to use some lemon flavouring if you’d like, I found the lemon juice gave a great flavour. Beat together until it’s a smooth and spreadable, then set aside until needed later. 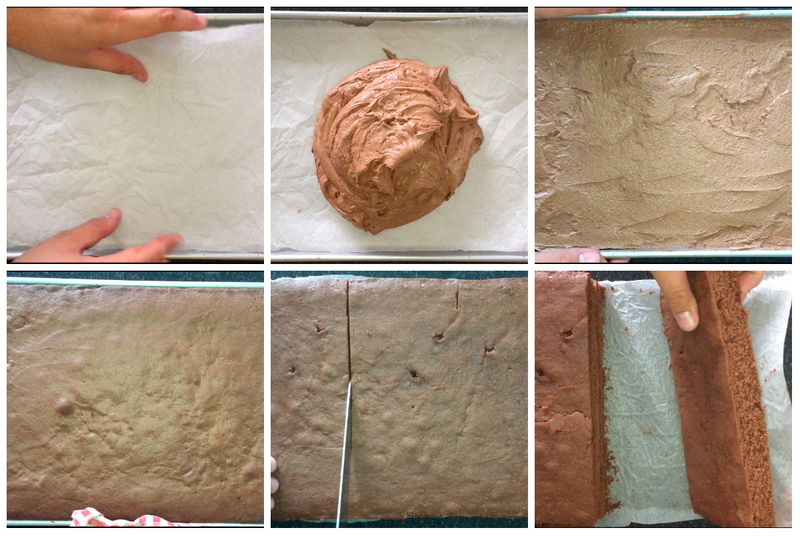 Now that you’ve got all the different parts done, you can start assembling your cake. Start by getting your layers of cake and levelling off the slight domes they have, this is optional but I wanted to remove them. Onto the cake, you’ll want to generously brush over the lemon simple syrup that you made earlier on in the recipe, make sure that you are giving each layer of cake roughly the same amount (and try not to over simple syrup them). Once you’ve got the cakes coated in the simple syrup, you’ll want to apply your buttercream, you can do this a few different ways but I went with placing the buttercream into a piping bag, fitted with a plain 1cm piping nozzle and onto one of my cake layers, piped small amounts or blobs around the edge and a swirl of icing to fill the centre. Just before I sandwich the 2 cakes together, on top of the buttercream (right in the centre) I place a generous amount of the blueberry jam that was made earlier on, I then sandwich the 2 cakes together and finish the cake by spreading a good amount of buttercream on top of the cake and spread it out using my small cranked/offset palette knife and because I had a small amount of buttercream leftover, I piped 4 rosettes onto the cake and top each of them with a blueberry. You can then leave the cake for a short while at room temperature so the buttercream firms up a bit or you can enjoy it straight away. This cake is perfect for this time of year, the end of summer and the start of autumn – so I hope you get to make this cake soon! Zest of 1 large lemon. 150g Blueberries (fresh or frozen). Small amount of flour (for the blueberries). A few teaspoons of lemon juice. Start by doing some prep work. Preheat your oven to 180˚c/350˚f, weigh up your ingredients and prepare your cake tins if needed with some parchment or by buttering an flouring them. To make the cake, place the butter and sugar into your mixing bowl of choice and beat together until well combined. Once well combined, add in your eggs. One at a time and beat well in between each addition. If you notice the mixture curdling, add a small amount of your weighed out flour to prevent the curdling. Repeat until all your eggs have been fully incorporated. Next add in the dry ingredients, so your flour, baking powder and salt but pass them through a sieve first, this is just to remove any lumps. Then mix the flour in on a low-medium speed just until the flour is incorporated, being careful not to over-mix at this stage (otherwise your cakes will turn out tough). Into small bowl add your blueberries and a small amount of flour, just enough to give them a good coating. 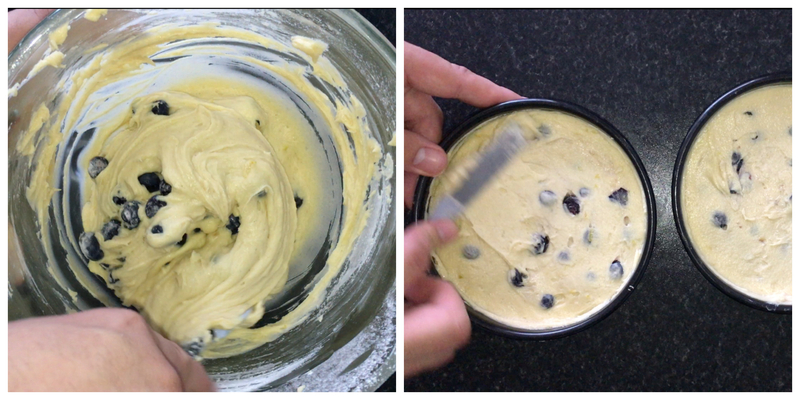 By coating the blueberries in flour you will prevent them from falling to the bottom while baking. Divide the batter between your 2 prepared cake tins (I did this by using digital scales but feel free to eyeball it) and then level them off as best you possibly can using a small offset/cranked palette knife or the back of a spoon will also work. Place them into your preheated oven and bake for 25-30 minutes (or until risen and golden brown). Get yourself a small-medium saucepan and place the water an sugar into it and give it a brief mix, then add in your lemon slices and place on the hob over a low-medium heat. Keep your eye on the mix, it should reach a boil before you remove it from the heat. It will be noticeably thicker in consistency and very hot, so don’t touch or taste it. Get a medium bowl/jug and a sieve/strainer and pass the simple syrup through it, collecting the liquid in the bowl/jug below. Set it aside and allow it to cool completely before using it. 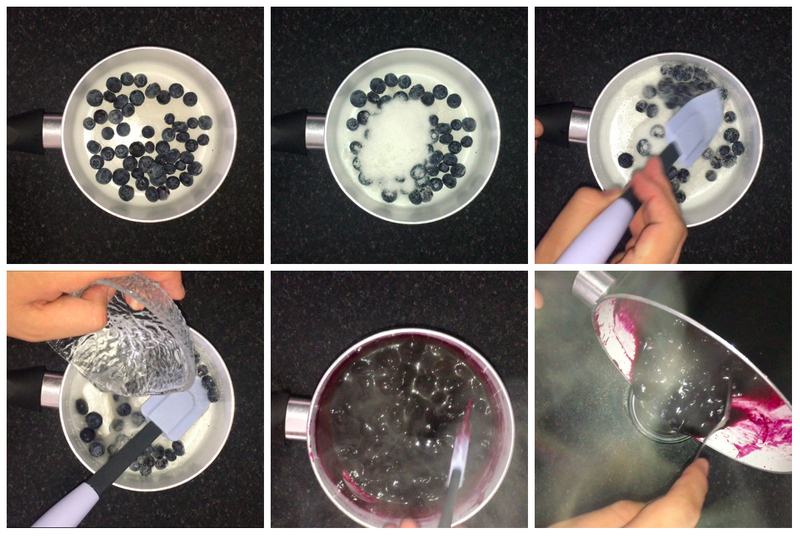 Get yourself another small-medium saucepan and place your blueberries and sugar into it and give it a quick mix, then add in the water and give it a quick mix to combine it a little. Now transfer the saucepan over to the hob and place on a low-medium heat and allow to come to a simmer, stirring it every now and again. 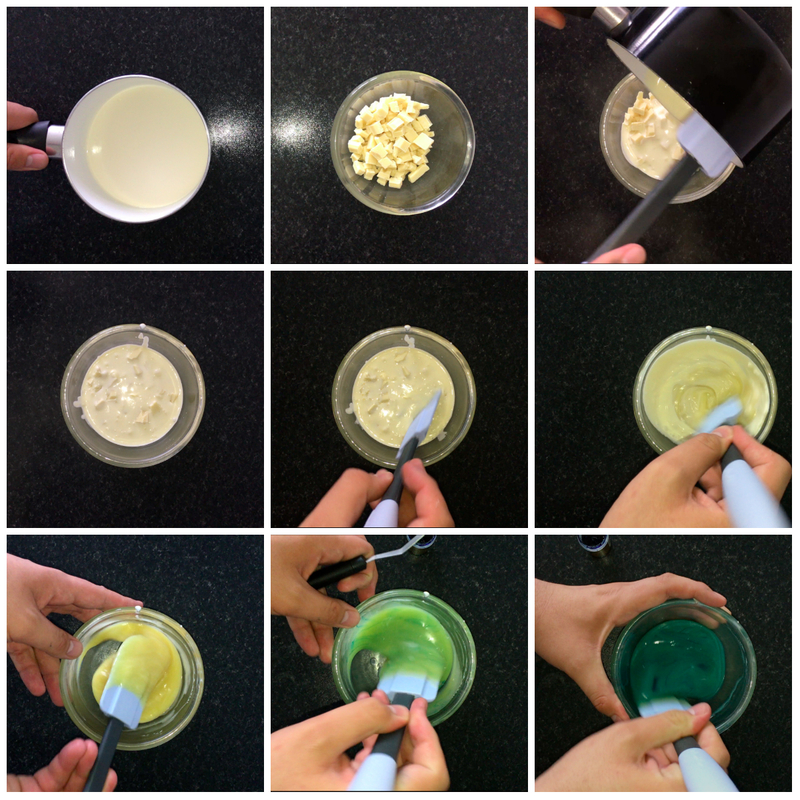 You will notice that the mixture thickens up as it gets hotter and the ingredients combine. Once you can tell its thickened, remove from the heat and transfer to a jar. Although it looks quite runny at the moment, don’t worry, as it cools it will thicken and look more like jam. While your cakes are cooling, its best to make your buttercream. 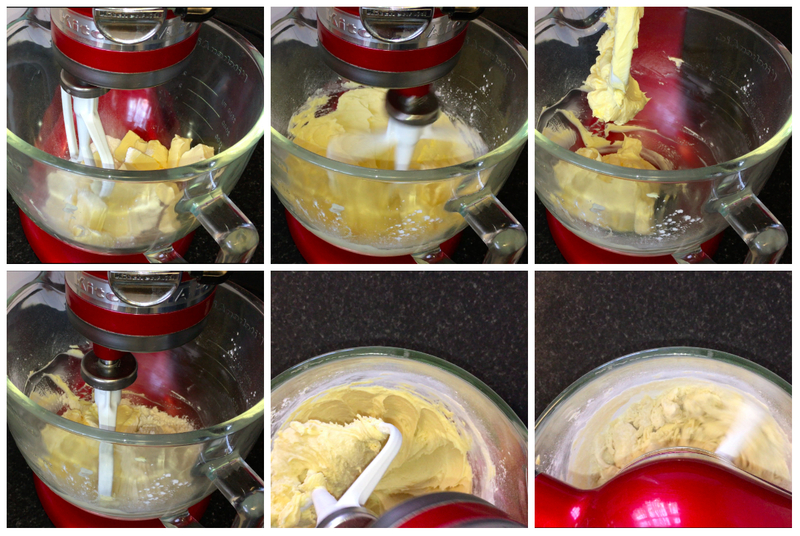 Into your mixing bowl, add your butter and beat it on its own for between 5 and 7 minutes. You’ll notice that in this time its become lighter and fluffier in colour and consistency. Scrape down the sides and bottom of your bowl. Add in all the icing sugar and start beating it on a low speed to start, working your way up to a medium then onto a high speed to make sure its all fully combined. Add in some lemon juice, a little at a time. 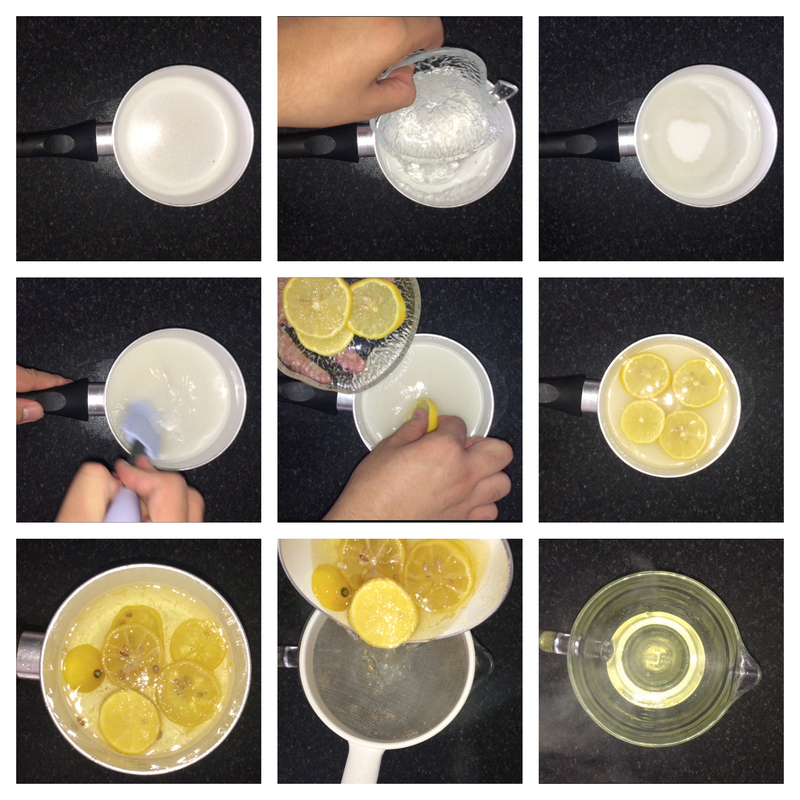 This will help flavour and loosen the mixture, feel free to use lemon flavouring if you’d like too. Beat that in, then scrape down the sides and bottom of your bowl again. Then set aside until needed later on. Just before you get into assembling your cakes, you’ll want to level your cakes as best you can. To do this you can use a cake leveller (which is what I recommend) but if you don’d have one, don’t worry. You can also use a knife (but I dont trust myself with a sharp knife), use whichever method works best for you. 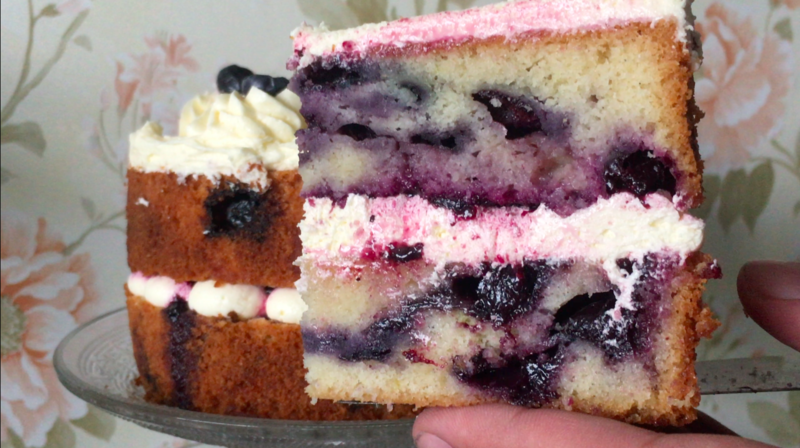 Check that you’ve got all your bits: the cakes, simple syrup, blueberry jam and buttercream. 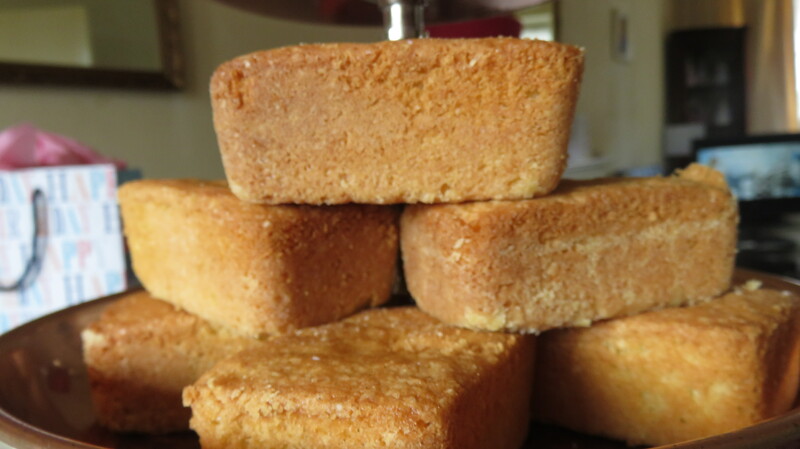 Take your levelled cakes and give them a generous soaking with the lemon simple syrup. Make sure you give each layer of cake roughly the same amount of simple syrup and most importantly, don’t over do the simple syrup. 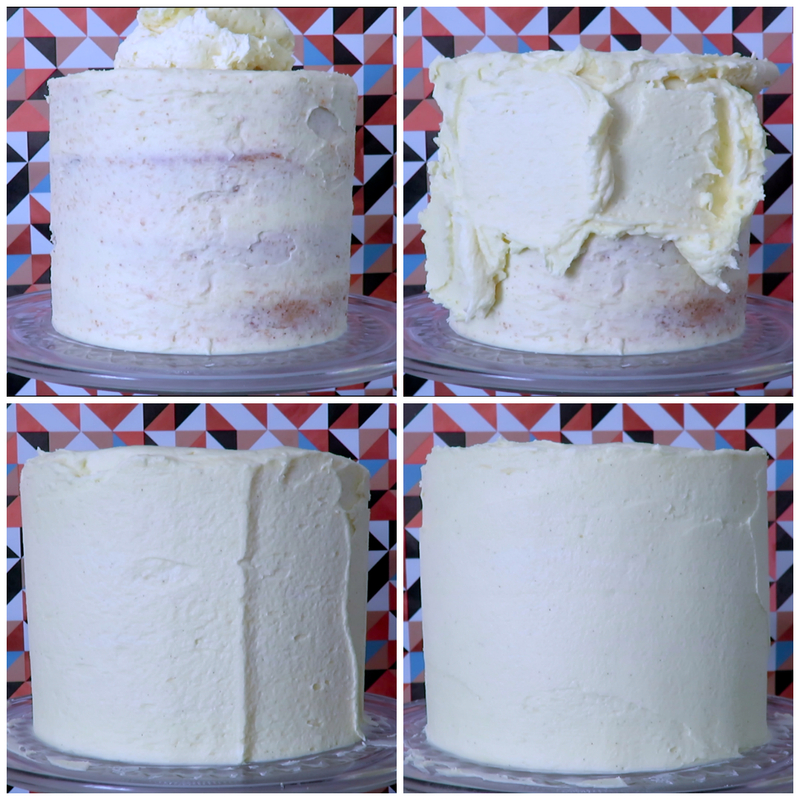 Next, you’ll want to place your buttercream onto one of your cake layers. I put my buttercream into a piping bag fitted with a 1cm plain piping tip, but feel free use what you have or what you like. I pipe small blobs around the edge of the cake, then a swirl of icing in the middle, don’t worry too much about the middle. 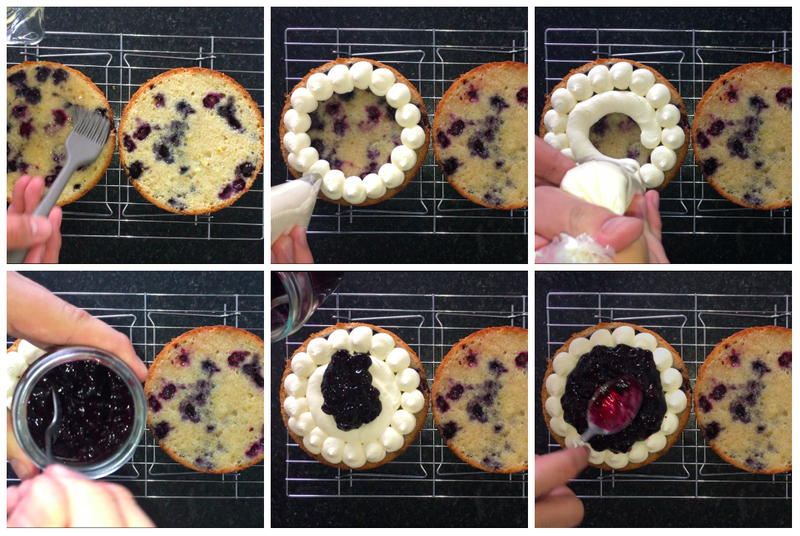 Into the middle of the buttercream, you’ll want to add a generous amount of then blueberry jam you made. Make sure its completely cool before using, otherwise it’ll be a big mess… I add a few tablespoons of the blueberry jam and it move into the grooves of the buttercream and some seeps out the side (oops). Sandwich the cakes together, using a little firm push. 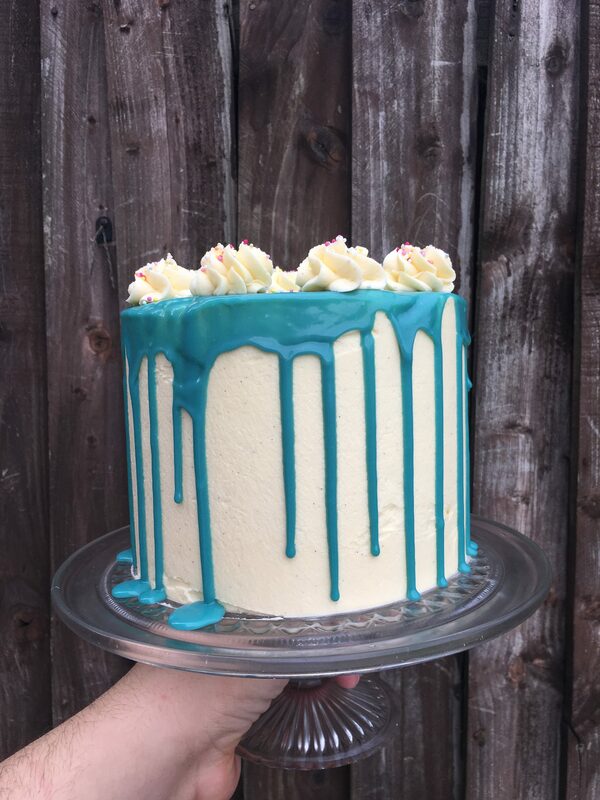 You could leave the cake like this if you wanted, but I recommend using some of the left over buttercream and putting it on top the cake and spreading it out using a small cranked/offset palette knife and with the last bit, I pipe some rosettes on top of the buttercream and top each of them with a blueberry. Feel free to customise the cake to suit you, its really up to you how you decorate it. I now recommend leaving the cake at room temperature for a while, so the buttercream firms up but if you can’t then don’t worry, have a slice straight away. If you’d like to see this recipe, why don’t you check out the YouTube video? 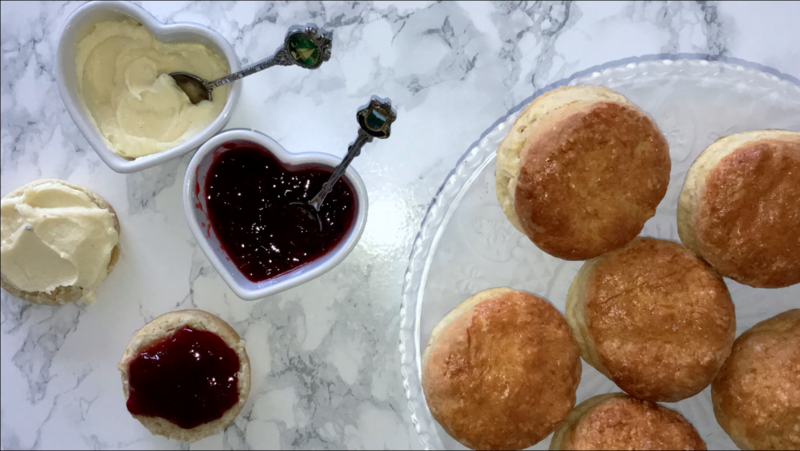 If you’re looking for a simple and straightforward recipe for plain scones, I have the perfect recipe for you right here. These are really quick and simple to make, you can whip a batch up in under 60 minutes, what’s not to love? Incase you haven’t ever tried a scone before, I’ll give you the rundown on what they are exactly. Scones are a slightly sweetend confection, which are that interesting on their own, however, when they are partnered with clotted cream and jam it makes them a whole lot more interesting. These scones are smaller than the ones you’d get in tearooms but are roughly the same size as the ones you’d find in supermarket bakeries here in the UK (which is still a decent size, it’s bigger than bitesize but smaller than the giant versions). The filling is also pretty simple, it’s just clotted cream and jam (I went with strawberry jam as I think this is the most traditional plus it’s what I had made not to long before this recipe) and depending on where you are will depend on whether you place the jam first or the cream first… To be honest, it doesn’t really matter at the end of the day, you’re still going to eat it either way. The process behind these scones isn’t hard at all and best of all, you don’t even need any specialist equipment. All you need are your hands, this is the best way to make them but feel free to use a food processor if you have one. To start, you’ll want to weigh up all of your ingredients, preheat your oven to 200˚c/400˚f and prepare your baking tray with greaseproof paper/baking parchment. place your milk into a small-medium bowl and add in the sugar and mix until the sugar is fully dissolved, then set aside (ideally in the fridge, until you need it. Try and keep the cold ingredients as cold as possible). Into a large bowl, add the flour, baking powder and salt and give a brief mix, then add in your cold cubed butter and work it in by rubbing the butter and flour together until they come together. To tell if this stage is done, you’ll notice a slight change in colour (a slight yellow-ish tint) but the most noticeable change would be the consistency, it will become more of a bread crumb or sandy texture. Once the correct consistency has been achieved, you can then add in your milk/sugar and mix this in using a spatula or you can do this by hand. Try not to overmix at this stage, as it’s very easy to do, so once a dough forms, you can stop mixing it. Generously flour your counter, then add your scone dough onto the floured surface and knead a bit of the flour into your dough if its sticky. Just knead until the dough becomes smooth, try not to overmix as this will result in a tough textured scone. 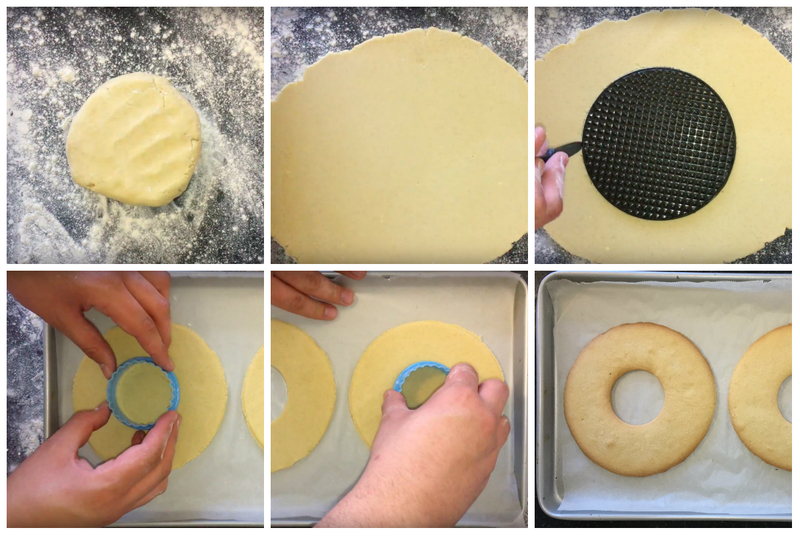 Roll out your dough slightly, it won’t take many rolls to get it to the right thickness (the right thickness would be around 3cm) you can then cut out your scones, I chose the plain edge but feel free to use the crinkled edge if you want to (use the 2 1/2 – 3 inch cookie cutter). Transfer your cut outs onto a baking tray lined with greaseproof paper and brush the tops of the scones with egg wash (the egg wash I recommend using is simply a egg beaten in a small bowl) and then bake them in your preheated oven for around 15-20 minutes, they should be golden brown once they are fully baked. Once baked, allow to cool on the baking tray for a few minutes before transferring to a cooling rack to cool completely. Once they have cooled completely, you can then slice them in half and place your clotted cream onto once half and the jam onto the other half. Sandwich the two together and finish the scones with a dusting of icing sugar. They are really that simple, nothing to complex about them at all, so I really hope you get to make a batch soon! Start by preheating your oven to 200˚c/400˚f, weighing up your ingredients and preparing your baking tray with greaseproof paper. To start the scones, place the milk into a small-medium bowl and add in the sugar. Whisk the two together until the sugar is dissolved in the milk, you can then set this aside (I recommend placing it into the fridge until you need it). Into a large bowl, place your plain flour, baking powder and salt and give it a brief mix. Into the dry ingredients, add in the butter and rub the dry ingredients and butter together until they become combined. You can tell when this stage is achieved but checking the colour of mix (if it’s got a slight yellow-ish tint, then you’re good) or the most obvious way is to check the consistency. If its a bread crumb or sandy texture, that’s what you’re looking for. Once you’ve reached the correct consistency, you’ll want to add in the milk/sugar mixture and stir it in using a spatula just until a dough forms (try not to overmix at this stage, otherwise it will result in a tough textured scone). Roll out your dough so its roughly 3cm thick, then using either a plain or crinkled edge cookie cutter (thats between 2 1/2 inch and 3 inch works well) cut out your shapes and place on a baking tray (if you re-roll the dough, make sure you only do it once, you should yield between 8-10 scones. Once your scones are on the baking tray, brush the top of each scone with the egg wash and then place in your preheated oven and bake for 15-20 minutes or until golden brown on top. Once baked, remove from the oven and allow the scones to cool for a few minutes on the tray before transferring them onto a cooling rack to cool completely. Once fully cooled, slice the scones in half and top one half with the clotted cream and the other with your jam and sandwich them together and finish with a dusting of icing sugar. Make yourself a hot drink and enjoy your freshly finished scone. So thank you for reading my blog post today, I hope you enjoyed. If you did, please show your support by sharing this recipe with your friends and family. If you do make any recipe of mine, don’t forget to share your pictures with me! If you’ve come looking for a recipe on how to make these interesting biscuit tarts, look no further, I certainly have you covered. After seeing these all over Instagram, I thought I’d jump on the bandwagon and make one. When I was researching what exactly these were and to be honest I didn’t get very far. I could’t find the exact name or a basic recipe for them, normally when something like this trends you can find the name and a recipe pretty easily, but I had my work cut out for me on this one. 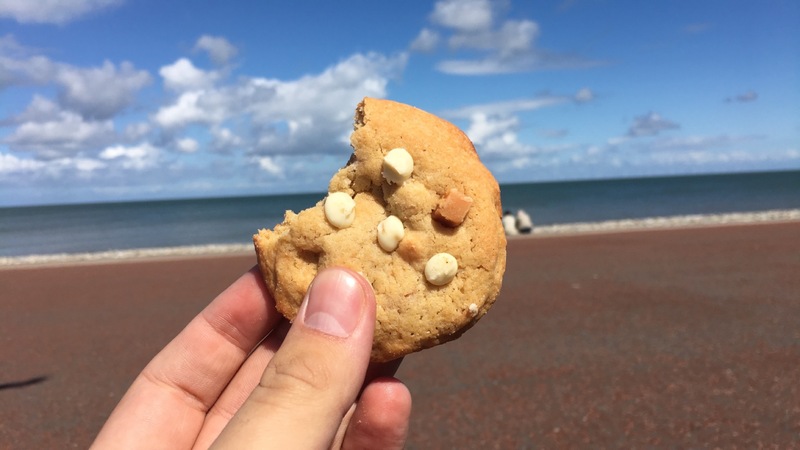 After about 3/4 day’s on Instagram I found the most common name/tag was ‘cream tart/s’ and I was amazed at how artistic some of the people had got with these. After seeing all the creative and over the top varieties online, so I opted to keep mine simple. I decided that a linzer biscuit would be ideal for this recipe, it’s a simple biscuit but it has a great taste and a softer crumb than most other biscuits. For the filling, I went with what was most common but with a little twist. In place of the standard whipped cream I opted for a sweetened version instead, I know for sure that this would compliment the biscuit and fruit very well. 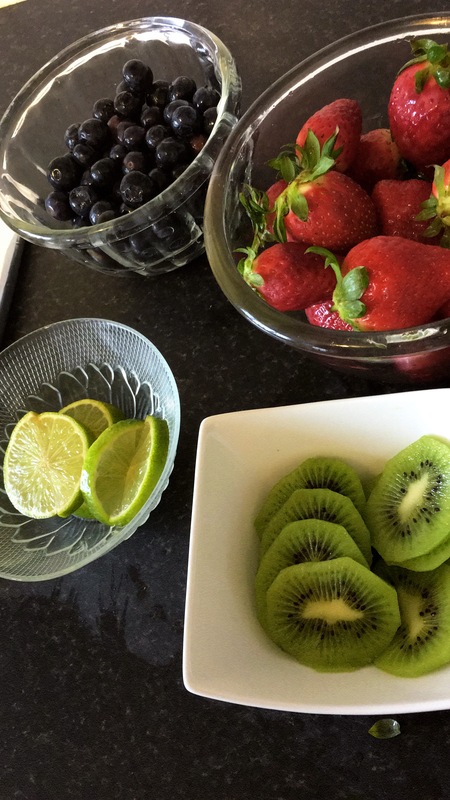 For the decoration I kept it simple, just fruit, I chose with strawberries, blueberries, kiwi and lime. Before you get into making the biscuits, make sure you have all your ingredients weighed up in advance and preheat your oven to 180˚c/350˚f. To make the biscuit part of the tart, you’ll want to place the butter and icing sugar into your mixing bowl and beat the two together over a medium-high speed until they are well combined. Once combined, scrape down the bowl and add in the egg and vanilla and mix them in on a medium-high speed until well incorporated, then scrape down the sides and bottom of your bowl again to incorporate any bits that may not have been fully worked in. Sift your flour into the mixing bowl and mix on a low-medium speed until a clear dough has formed. *Be careful not to over mix at this stage, otherwise your biscuits will be tougher in texture. Seeing as the dough doesn’t require chilling before use, split the dough in half and roll it out until it’s about 1cm thick and cut out the shape, I opted for a 6 inch/15cm round. To get the shape, I used the base of a cake tin and used a small, sharp knife to cut around it. I repeat that stage one more time and then transfer the cut outs onto a line baking tray and bake in your preheated oven for 15-20 minutes, remove from the oven and allow to cool completely before finishing. Talking of finishing these tarts, you’ll want to prepare your filling, which is a sweetened whipped cream. 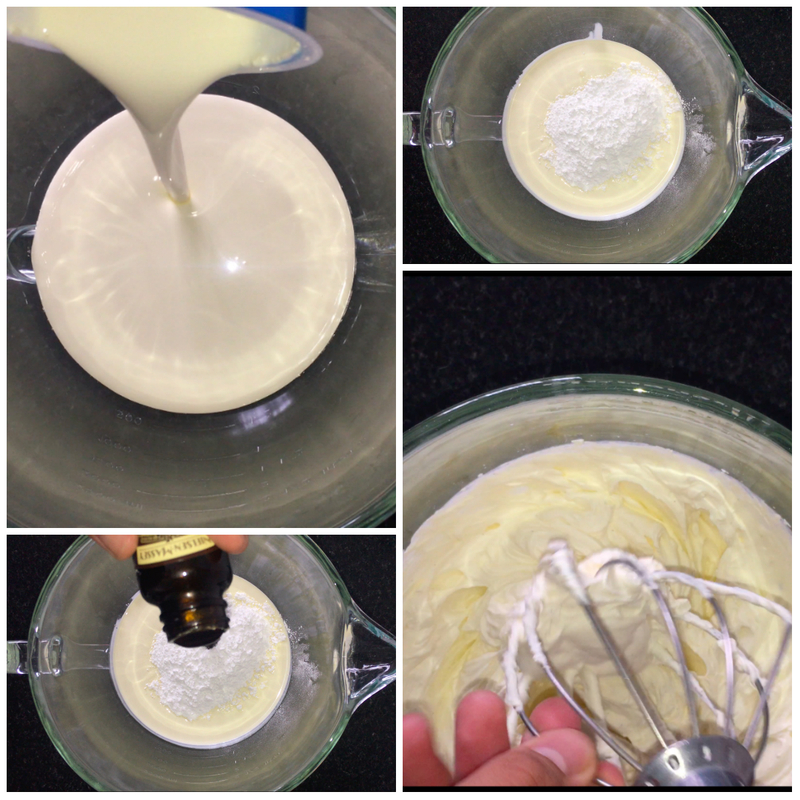 Place the double cream, icing sugar and vanilla into a bowl and whip it up until you achieve stiff peaks, then place into a piping bag with a 1cm plain tip nozzle and keep it in the fridge if you don’t intend on using it straight away. Finally, depending on what you’ve chose to decorate with, you’ll want to get it prepped and ready to use once you’ve piped your cream on. This is best eaten on the same day as it’s made or the following day. • 1/2 tsp Vanilla bean paste/extract. • 1 tsp Vanilla bean paste/extract. Before you get into making, you’ll want to do some prep. Weigh up all of your ingredients, preheat your oven to 180˚c/350˚f and line your baking tray. 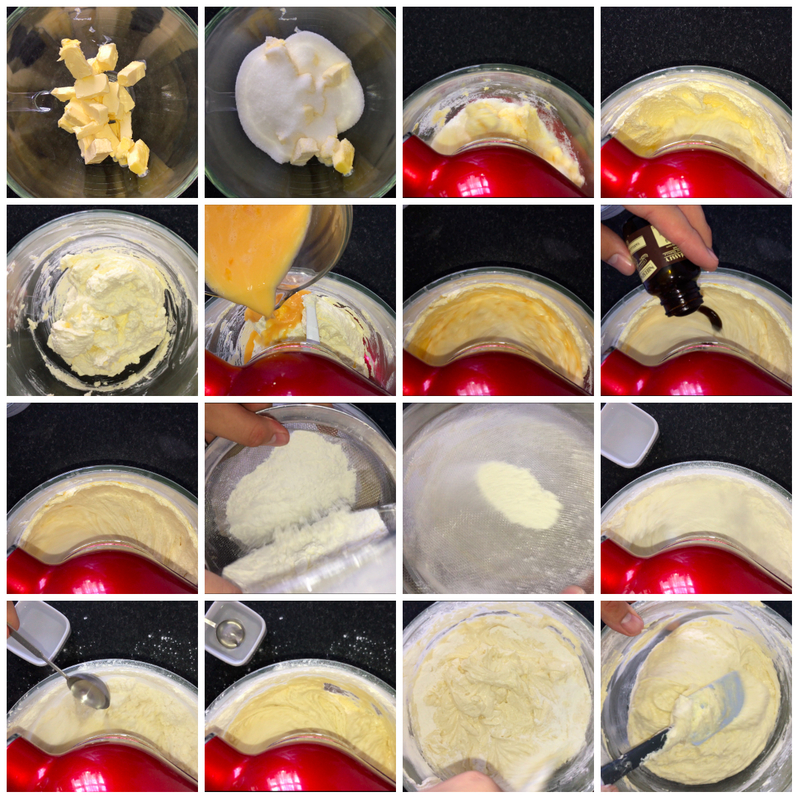 To start the biscuit dough, place the butter and icing sugar into your mixing bowl of choice and beat them together for around 2-3 minutes over a medium-high speed until it comes together and is well combined. Scrape down the sides and bottom of your bowl, to incorporate any bits that wasn’t fully worked in. You will then like to add the egg and vanilla, incorporate them over a medium-high speed just until they are incorporated. Scrape down the sides and bottom of your bowl again, just to incorporate any bits that wasn’t fully worked in. Next you’ll want to add in the flour, making sure that you’ve sifted it first. Add all the flour in and mix over a low-medium speed until a clear dough has formed. *Don’t over mix your dough at this stage*. Seeing as there is no need to chill the dough, cut the dough in half and roll it out on a floured surface until the dough is roughly 1cm thick. 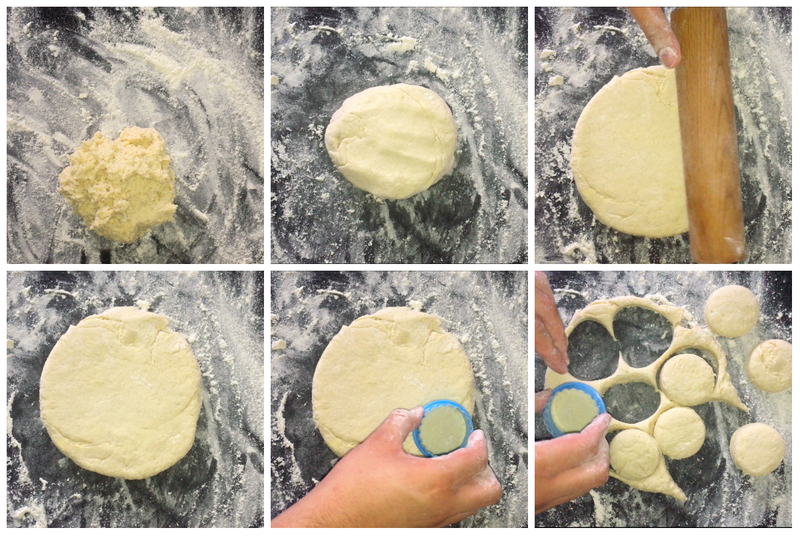 Once your dough is rolled out, you’ll want to cut out the shapes. 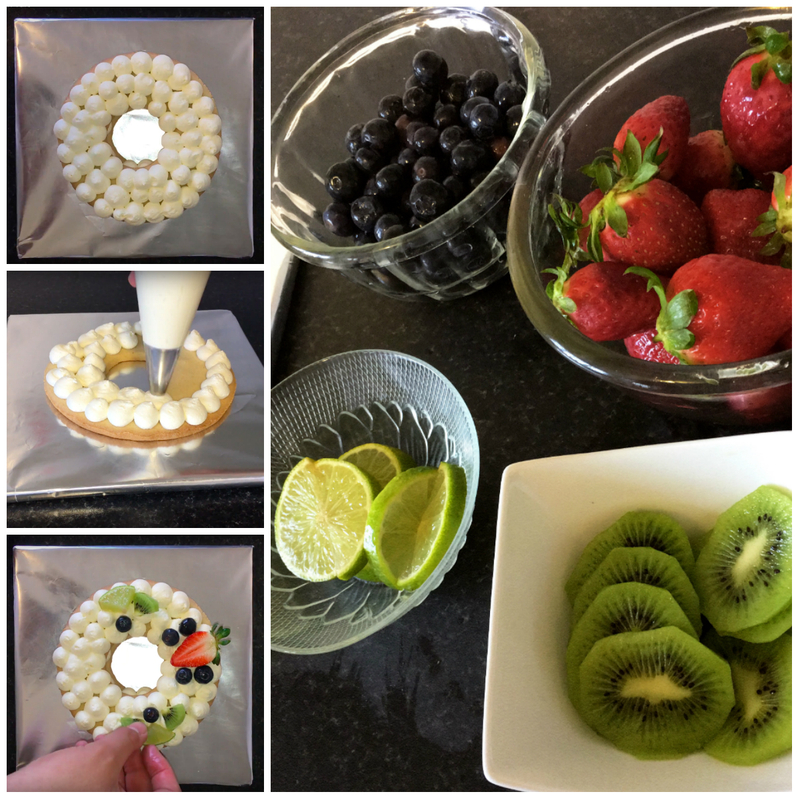 To make your cut outs, place a 6 inch/15cm circle shape on top and cut around it, I used the base of a cake tin and cut around it with a small sharp knife. 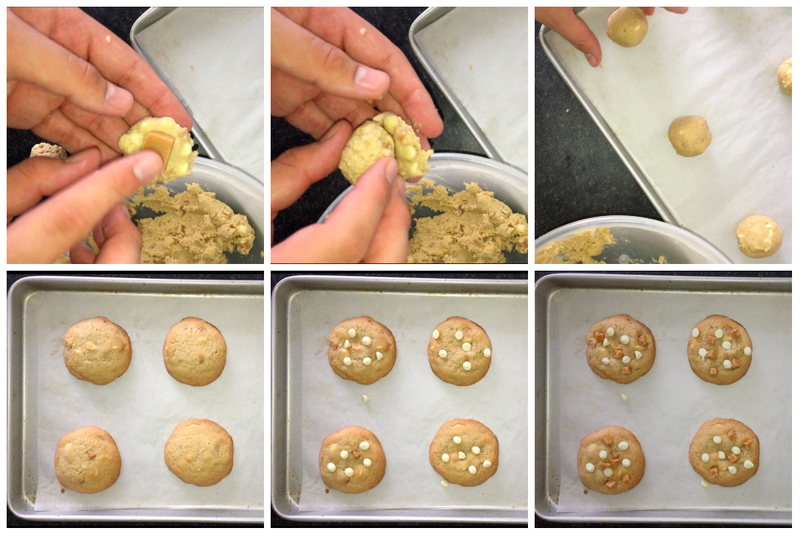 Move the cutouts onto your lined baking tray and use a smaller cutter to removed a hole in the middle of each cutout. Then place the baking tray in the oven and bake for 15-20 minutes (or until they start to colour around the edges). Once baked, remove from the oven and allow to cool completely before using. 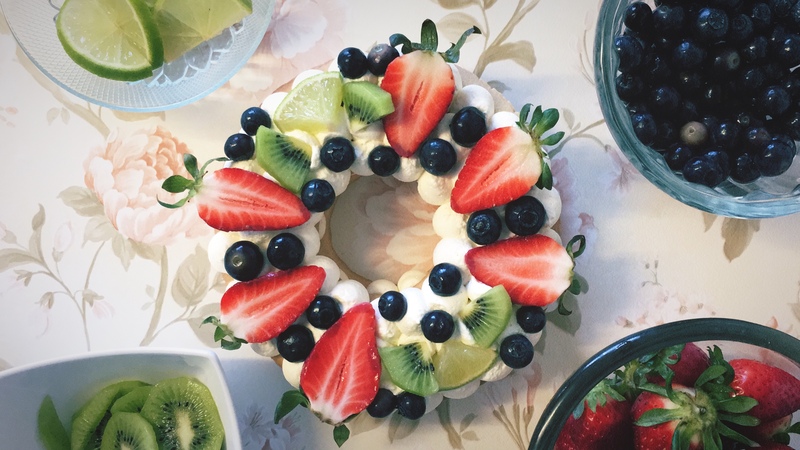 To make the sweetened whipped cream, place the double cream, icing sugar and vanilla into a bowl of your choice and whip it until stiff peaks form. 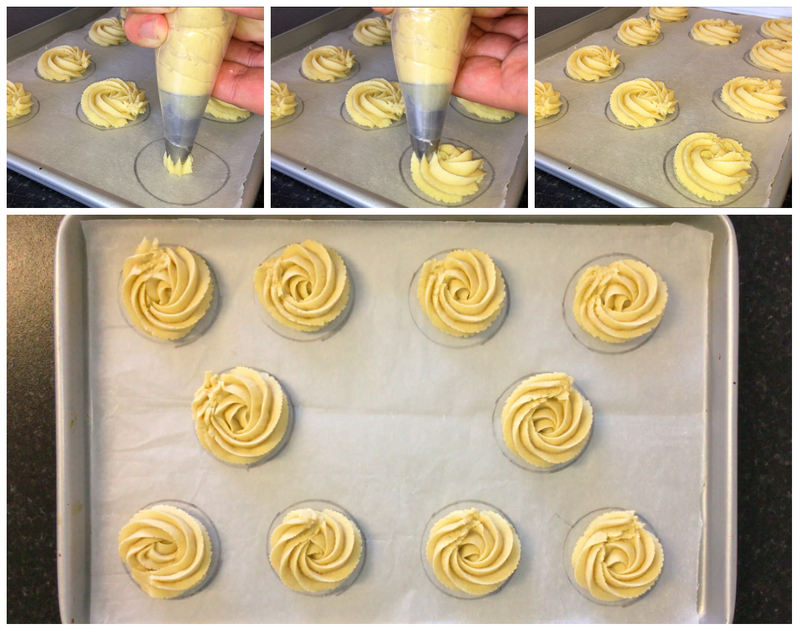 Transfer the whipped cream into a piping bag which has a 1cm plain tip nozzle. Place in the fridge if you aren’t using it straight away. Depending on what you have chosen for your topping, you may need to prepare it. If you have decided to use fruit, feel free to cut/shape it however you like. These can be fully customised to suit your occasion or the person who’ll be receiving this. Then place whatever you’re using on top, either following a pattern or making it look decorative, whichever you choose. Whatever you do use on top can add a lot of colour to these. If you do use flowers, please make sure you’re using flowers that are safe for human consumption, double check that they won’t have any harm to yours to others health. 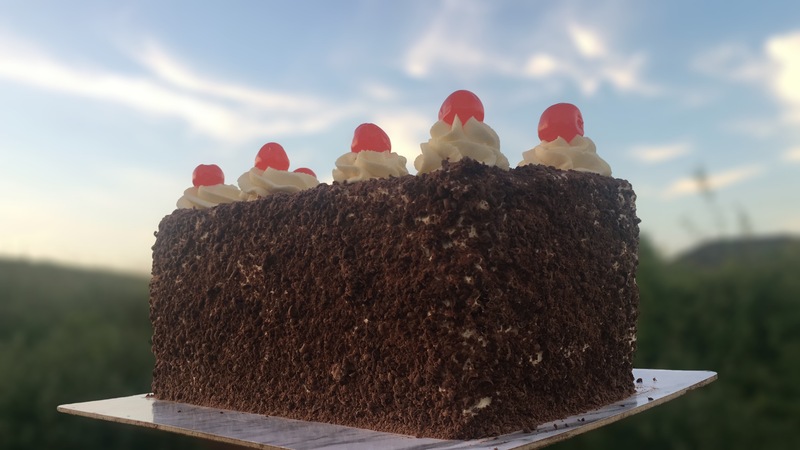 If you are looking for a different take on a black forest gateau, I have you covered. This recipe is perfect for sharing with your friends and family. 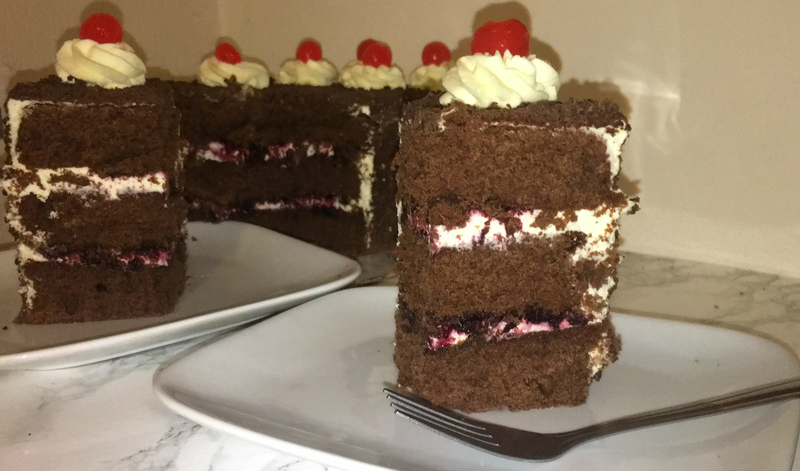 This cake was for a family members birthday and whenever I ask them which cake they’d like, its always a black forest gateau. However, I thought I’d play around with the idea and see what I could do. Instead of the cake being the traditional round shape, I chose a rectangle. You may not like the idea of a rectangle cake but it works surprisingly well, plus you can cut the cake to make generous portions regardless of how big or small you cut it. Anyway, less about that and more about the cake itself. The cake is made up of 3 layers of chocolate sponge cake (that can be brushed with simple syrup, I did one layer with simple syrup but forgot to do the rest… Oops!) which are layered with sweetened whipped cream and home made cherry jam, then coated in the same sweetened whipped cream, which is the crumb coat. Then its given a generous coating of the whipped cream and coated with the chocolate (I used grated but feel free to use your preference), I then normally set it in the fridge to firm up a bit before I finish it off. Once the cake has been in the fridge or around 30-45 minutes, I remove it from the fridge and pipe some rosettes on top and top each rosette with a maraschino cherry (feel free to use whichever cherries you can get your hands on). 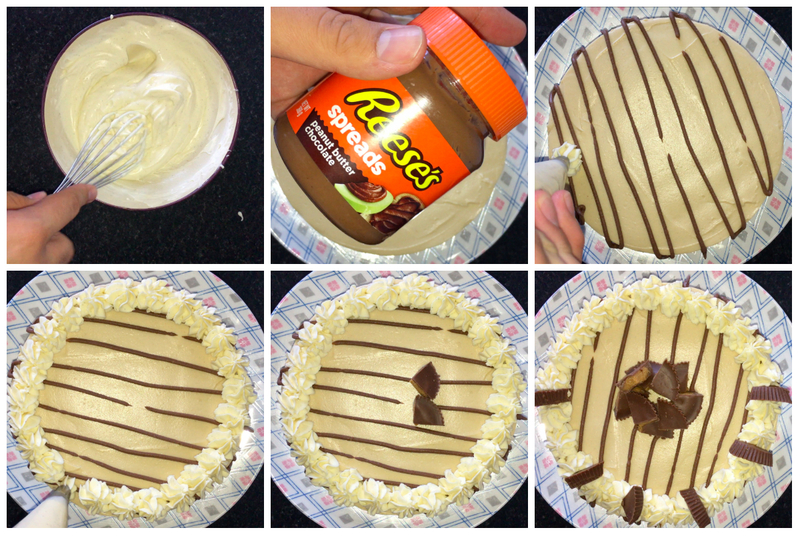 Making this cake isn’t that hard, the hardest part is probably making and baking the cake, let me be honest with you. To start the cake you’ll want to make sure you’ve got all of your ingredients weighed up in advance, your oven is preheated and your tray prepared (you can do this 2 ways, either lining the bases with greaseproof/parchement paper or generously buttering and flouring your tins, just make sure you’ve tapped out a majority of the excess flour). Once you’ve done all of your prep work you can start on your cake batter. Start by placing your butter and sugar into your mixing bowl of choice and beating the two together until they are well combined, they’ll be lighter and fluffier in consistency and colour. 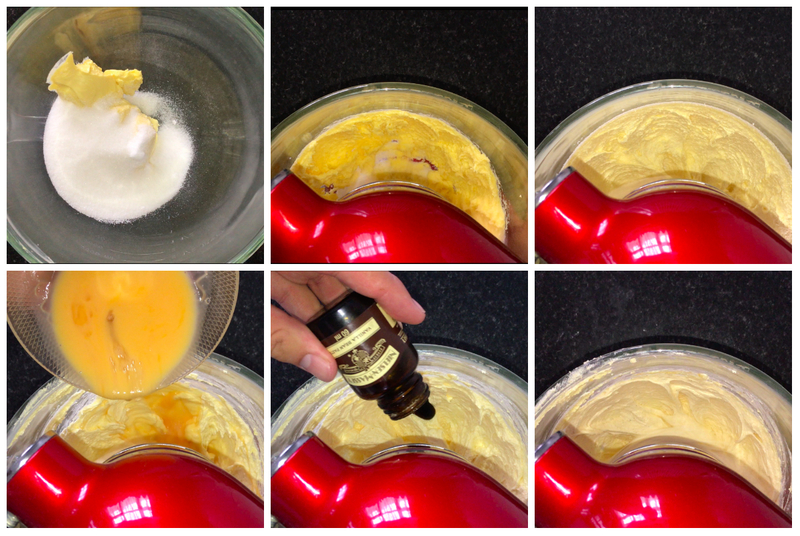 Once you’ve got your butter and sugar well combined, you can then start adding the egg. 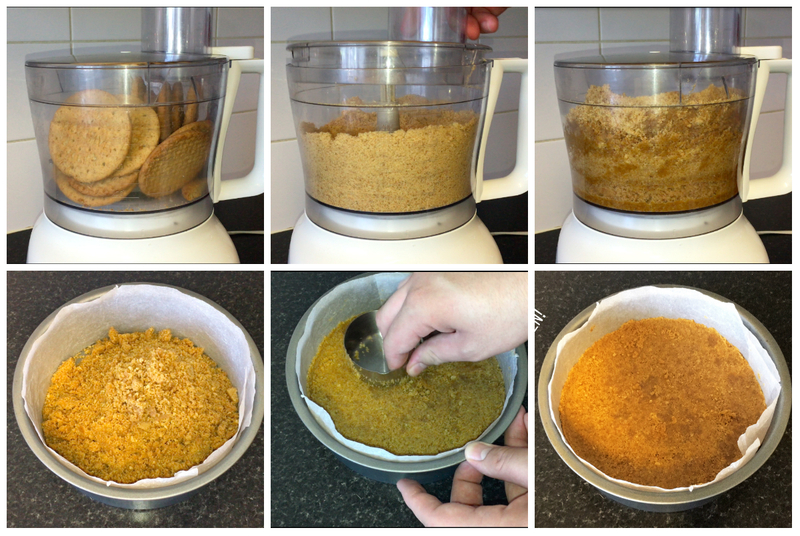 You’ll want to do this gradually so you don’t curdle the mixture, a little at a time will help you from doing this. In a separate bowl, add in your dry ingredients and give them a good mix before adding into your mixture. Add all of your flour into your mixture but pass it through a sieve first to remove any lumps. Mix the dry ingredients in over a low/medium speed, to loosen the mixture slightly I added slightly cooled down boiled water and add it in a tablespoon at a time but feel free to use milk if that what you’d prefer (I will leave all weights and measurements down below). Mix in all your water and make sure there are no traces of any single ingredients. Once you’ve got your cake batter made, you’ll want to place it all into your prepared tray and spread it until its one consistent level. I used a small cranked/offset spatula to do this but feel free to use whichever utensil you like, a large cranked/offset spatula or silicon spatula will work very well also. Place the baking tray into your preheated oven and allow to bake for around 30-35 minutes (time will vary depending on your oven). Once fully baked, remove from the oven and allow to cool completely before removing from the tray and cutting it up for the three slices that you’ll need. Once the cake is cooled, you can cut it up into 3 layers and set aside. It’s at this point you’ll want to simple syrup the layers if you’re deciding to do it. In your mixing bowl, pour your double cream, icing sugar and vanilla and whip them together until they have reached a stiff peaks stage, be-careful not to over whip at this point. If you decide to make your own cherry jam, it’s really simple to make, place the cherries, sugar and water into a saucepan and place over a medium heat and leave it for 12-15 minutes until thicker in consistency, if the fruit is still quite large, quickly blitz it in a food processor to break it down a bit, allow to cool before using. To assemble the cake, get your board or plate of choice, I went with a placemat I’ve never used as it was the perfect size for my cake, but use whatever you have and works well. Spread a small amount of the whipped cream on the base and place your first layer of cake on top of it and press it down a little just to secure it in place, then you’ll want to spread a generous amount of the whipped cream on top of the cake layer, followed by the cherry jam and repeat the process with the next layer of cake. leave the top clear for now, as you’ll want to do a thin layer of the cream to act as a crumb coat and chill in the fridge for 30-45 minutes. 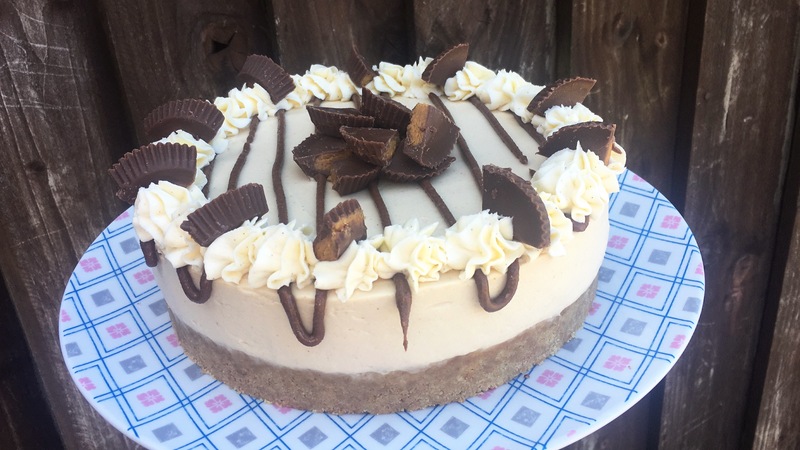 Once its firmed up after about 30-45 minutes, you’ll then want to spread a generous amount of the whipped cream onto the top and sides, then coat with a copious amount of chocolate, I used grated as that’s what I prefer but use whatever you can get or prefer. Then you can finish the cake. Place some of the whipped cream into a piping bag which has a open star tip nozzle at the end and pipe on your rosettes, I went for 8 but feel free to add more if you’d like, its completely up to yourself. 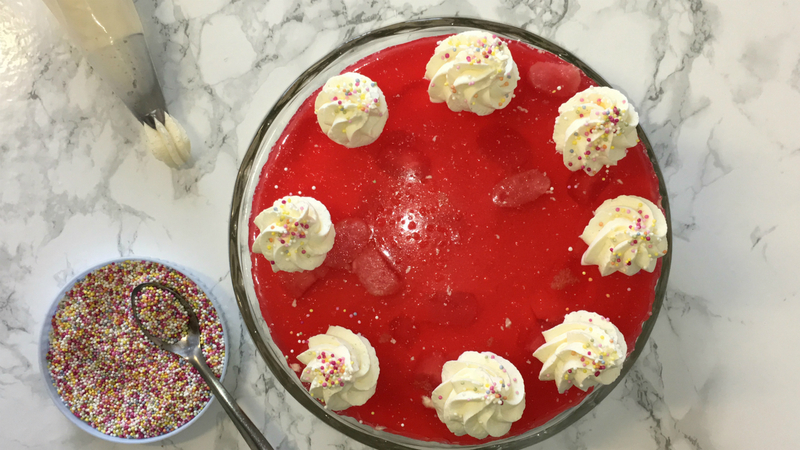 To finish the cake completely, add a maraschino cherry on top of each rosette you’ve piped out. 4-5 tbsp Boiling water/milk (whichever you prefer, either works well). Start by weighing up all your ingredients, preheating your oven to 180˚c/350˚f, preparing your tray and making your cherry jam if you’re making it. To make the cherry jam, place the cherries, water and sugar into a medium saucepan over a medium heat and leave for 12-15 minutes until thicker in consistency. If it’s still quite chunky, blitz it in the food processor. Set aside and allow to cool completely before using. To start on the cake batter, place your butter and sugar into your mixing bowl of choice and beat them together until they are lighter and fluffier in consistency and colour. This normally takes about 7-10 minutes depending on the speed you’re using. Scrape down the sides and bottom of your bowl and start adding your egg. Add a little at a time, this is the best way as it prevents scrambling of the mixture. Beat your eggs all together before you intend on adding them, this will allow you to add smaller amounts, rather than a whole egg each time. Repeat this step until all of your eggs have been added. Scrape down the sides and bottom of your bowl, the sis just to incorporate any bits from earlier on that may not have been from earlier on. Place all your dry ingredients into a bowl and mix them together, then pass the through a sieve just to make sure there aren’t any lumps. I sieve my dry ingredients directly into the mixture bowl, feel free to do the same. Mix the dry ingredients in over a low-medium speed. While the flour is incorporating, you’ll want to gradually add the water/milk, make sure it incorporates fully before adding more liquid. Once you can see the flour and liquid are fully incorporated, you can then turn the mixer off and scrape down the sides and bottom of the mixing bowl. 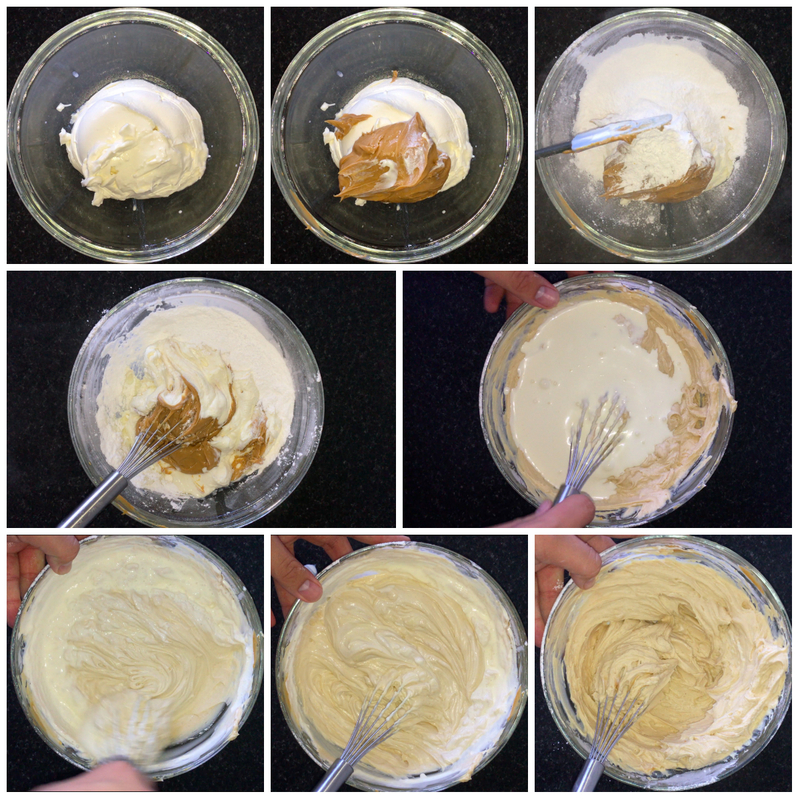 Transfer the cake batter into your prepare tin and spread it out as evenly as possible. I used a small cranked/offset spatula to get it as level and smooth as possible but use whichever utensil may work best for you. Place the tray into your preheated oven and bake for around 30-35 minutes or until a tester comes out clean. The time will depend on your oven, so the time may need to be adjusted. 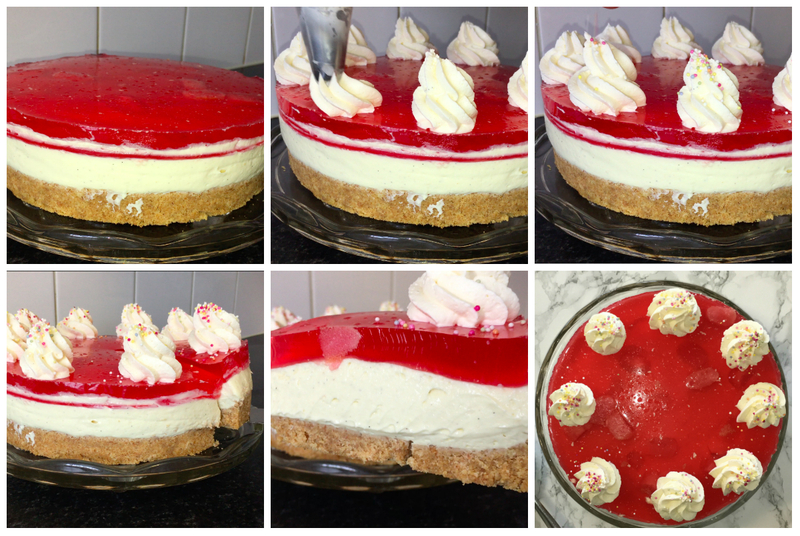 Once fully baked, allow to cool completely then slice up into your equal layers, you’l want to make 3 equal layers. Set aside until needed. Whip up a batch of the whipped cream, placing the whipped cream, icing sugar and vanilla into your mixing bowl and whip until it reaches a stiff peak. Try not to over mix at this stage as it will ruin the cream. If you’re making a batch of the cherry jam, place the cherries, sugar and water into a spacepan and place it over a medium heat and leave for 12-15 minutes until its thicker in consistency, you may need to pulse this in a food processor if its still quite chunky. Allow to cool completely before using. Take your board/plate and spread a small amount of the whipped cream onto it and gently press a layer of the cake on top of it. Repeat this stage with the next layer of cake but for the final layer keep it plain. Next you’ll want to do a crumb coat using a small amount of the whipped cream. This is to lock in those pesky crumbs that now won’t ruin your final coat of whipped cream. Once coated, place in the fridge for 30-45 minutes until firm. Once it’s firmed slightly, apply a generous final coat, here is the perfect time to use a majority of the whipped cream. You’ll want to coat the outside of the cake with the grated chocolate (use whatever you have or prefer). Make sure you use a good amount of the chocolate on the finishing. Once fully coated, place in the fridge for 30-45 minutes. To finish the cake you’ll want to pipe out rosettes on top, I did 8 but you could pipe more on there easily. Top each of the rosettes with a maraschino cherry and enjoy. 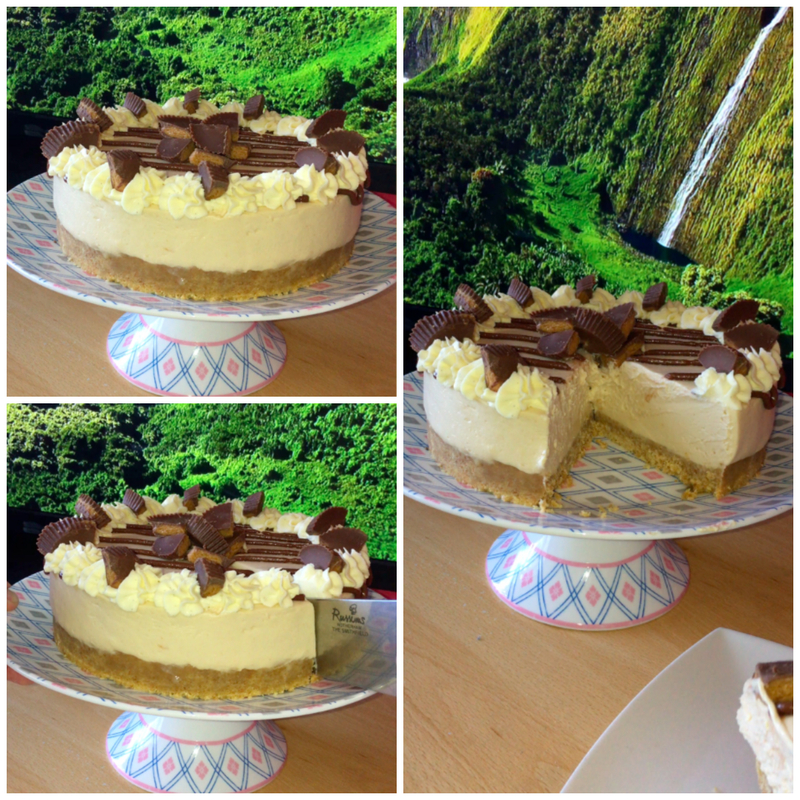 This cake is best enjoyed on the day its made but can also be enjoyed the day after. 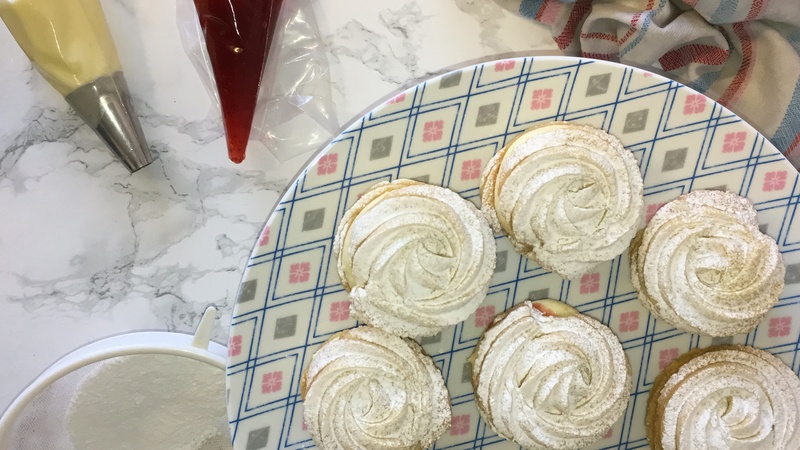 I have the the best and most straightforward recipe for viennese whirls you could possibly need. If you’re from the UK then you probably recognise these from a well known cake brand, which is available in in most supermarkets. 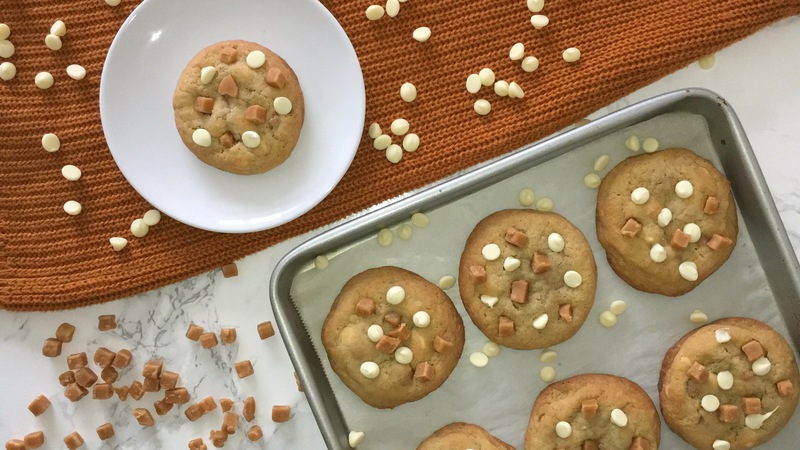 Forget about those, once you make a batch of these up for yourself, you will not look back! The biscuits themselves only require 4 ingredients, so they are cheap, quick and easy to make. They can be enjoyed on their own or with the vanilla buttercream and strawberry jam fillings, which compliment the biscuits pretty nicely and the other thing to know about theses that they are fairly bigger than the ones you’d get in the box from the supermarket (I’m a greedy git), so feel free to lower the amount of filling compared to what I used. 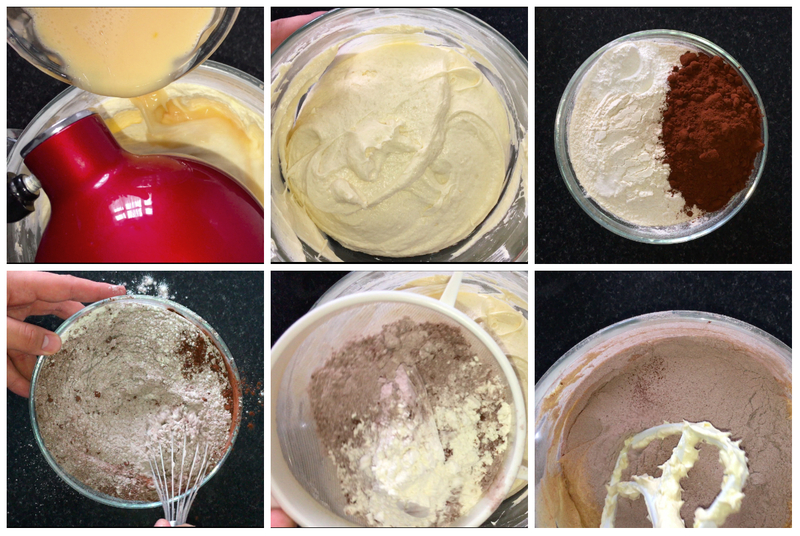 The mixing process is easy, it doesn’t matter if you’re using a wooden spoon, electric hand mixer or a stand mixer. It’s the piping that can be a bit difficult and this is because of the amount of flour which is used in these biscuits, it’s a lot. The dough can easily be handled with your hands but to get the signature piped look on top you need to use a piping bag and star tip nozzle, I recommend using a open/wide star tip as to a closed star. If you find your dough hard to pipe out, use the warmth from your hands to warm the dough through the bag (if you try and pipe the dough while it’s too stiff then you will be pushing too much pressure towards the bottom of the bag and it will more than likely split open plop a good amount of the dough out of the bag). So to get started, you’ll always want to prepare your baking tray, I drew around a circle cutter so my biscuits would be roughly accurate in size to one another, this is ideal if you’re not sure on sizing them. Also, don’t forget to weigh up your ingredients and preheat the oven to 190˚c/375˚f. Now you can start by placing the butter and icing sugar into your mixing bowl of choice and beat the two together until well combined. Then add in your first weight of flour and mix that until well combined, scrape down the sides and bottom of your bowl, then add in the second weight of flour and mix it in until well combined and thats the dough done. Place a open star nozzle into a piping bag and add around about a handful or so of the biscuit dough. If the dough isn’t piping well, use the heat of your hands to warm it up just enough to pipe out your rosettes. These don’t really spread in the open so feel free to pip quite a few onto one tray and place them in your preheated oven and bake for around 18-20 minutes (or until they start to colour around the edge. As for the filling, I have recommended using vanilla buttercream and strawberry jam but feel free to replace those if you don’t like my choice. 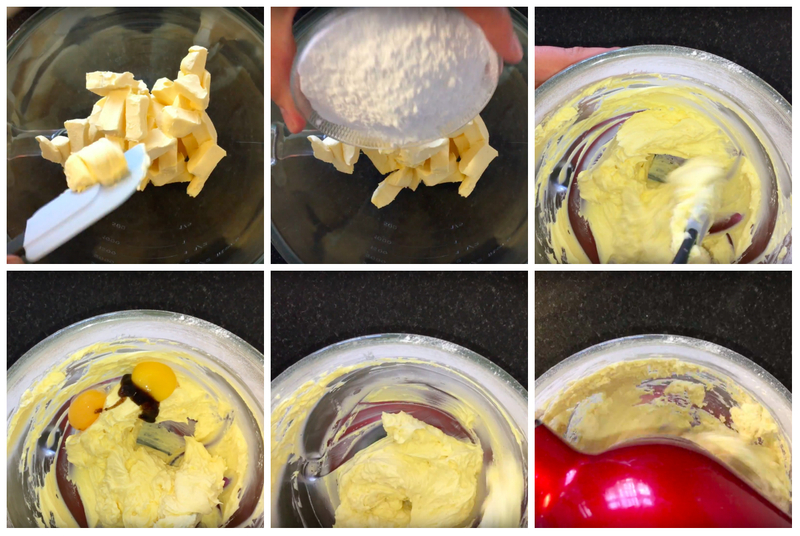 Make your buttercream while your biscuits are baking, start by placing the butter into a bowl and beating until lighter in colour and consistency. Scrape down the sides and bottom of your bowl and place roughly half the amount of icing sugar and beat until fully incorporated, repeat this stage with the remaining icing sugar. Once all the icing sugar is fully incorporated, add in the vanilla extract or vanilla bean paste an mix until well combined, if your buttercream is a little too thick, add a splash of milk just to get it to a more spreadable consistency. As for the jam, feel free to use whatever you’ve got, homemade or shop bought will work well here. For the assembly of these biscuits, pair your biscuits up and onto one half of them, pipe on a good amount (or a generous amount if you have a sweet tooth) and then pipe on a small amount of jam in the centre of the buttercream and gently place the other biscuit on top of the filling, sandwiching them together. Just before you tuck into one, you’ll want to give them a justing of icing sugar to finish them off, now sit back and enjoy one of these. Bake them in your preheated 190˚c/375˚f for 18-20 minutes. Strawberry jam (but feel free to switch this to a jam or spread you might prefer). Weigh up all of your ingredients, preheat your oven to 190˚c/375˚f and line your baking trays with greaseproof/parchment paper. Start the biscuits by placing the butter and icing sugar into your mixing bowl of choice and beat them together until well combined and lighter in colour. Scrape down the sides and bottom of your bowl, to incorporate any bits from earlier on. Then add in your first weight of flour in and mix that in until just combined. Scrape down the bowl again to incorporate any bits that have worked up the bowl. Add in the second weight of flour and just mix that in until its just combined. 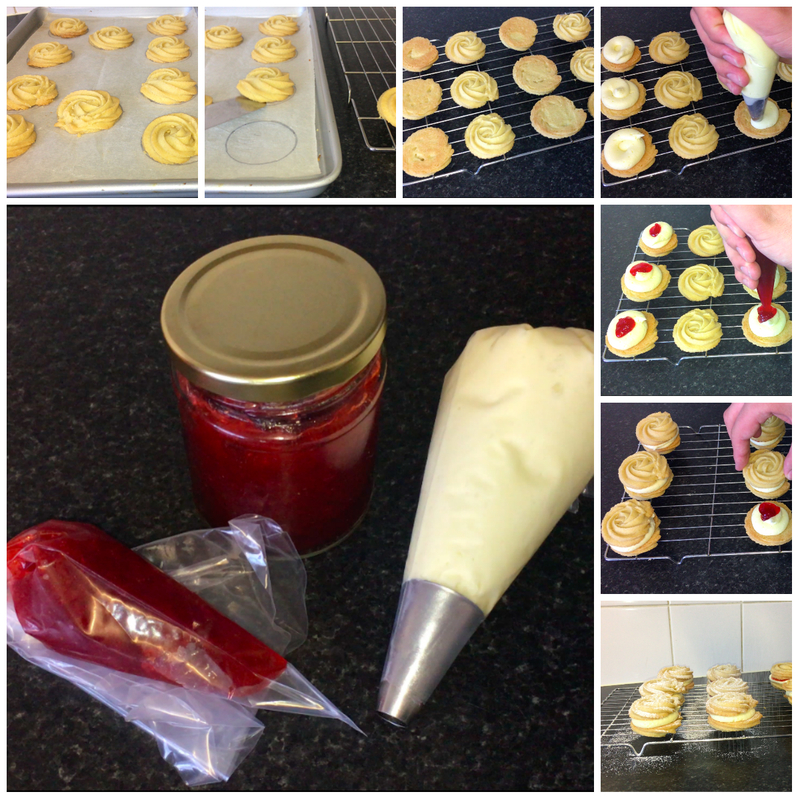 Prepare a piping bag by placing a 12mm open star nozzle at the end and place a good amount of the dough into the piping bag. Pipe out the dough onto your lined tray (draw some templates if you want to get your biscuits more uniform), these don’t spread very much while in the oven so leave a small space in-between each biscuit. Place the tray in your preheated oven and bake for 18-20 minutes (or until they start to colour around the edges). Once fully baked, remove from the oven and allow to cool for a few minutes on the baking tray, then transfer them over to a cooling rack to cool completely. Weigh up your ingredients in advance. 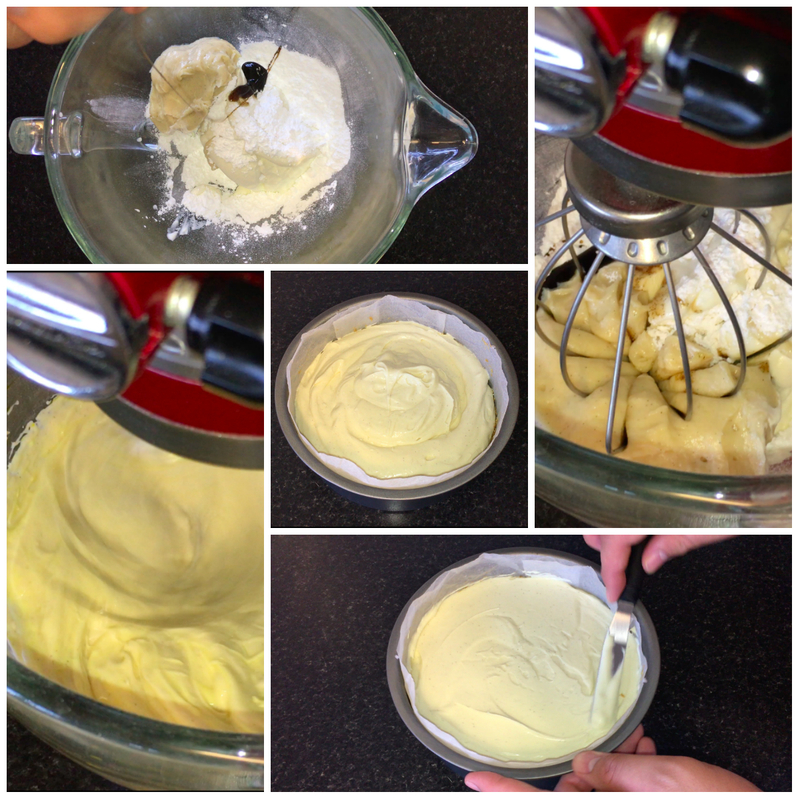 Place the butter into a mixing bowl an beat it over a medium-high speed until lighter in colour and consistency. Once lighter, you’ll want to add in around half of your icing sugar (make sure you’ve sifted it first, to remove any big lumps) and beat that on a low speed working it up to a high speed, scrape down the bowl and repeat this stage for the other half of the icing sugar. Add in the vanilla (and milk if the buttercream is too stiff, this will help loosen the buttercream down) and mix until well incorporated. Place the buttercream into a piping bag with a 12mm star nozzle and set aside until its needed.